You could easily pass by Terroirs and miss it. 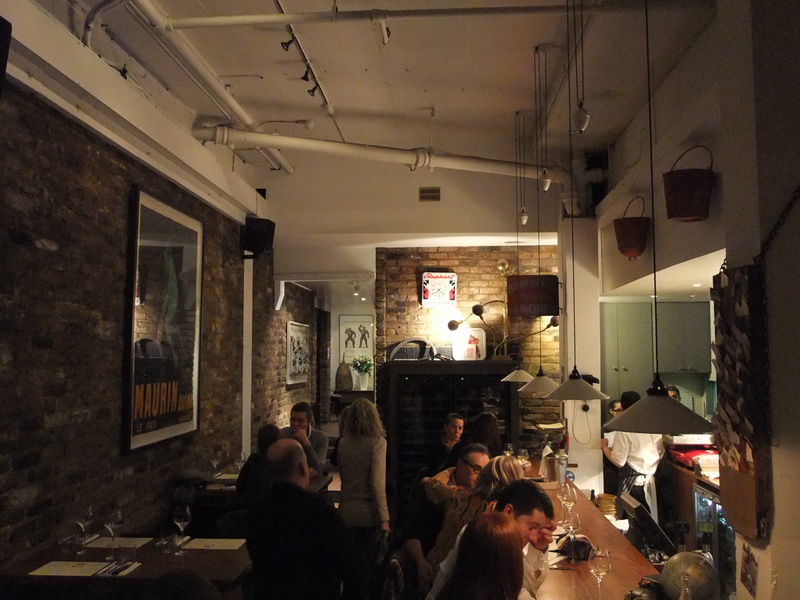 A wine bar located on an anonymous side street off the Strand right next to an exit from the Charing Cross Tube station seems an unlikely place to find something good to eat, but it is. In this case London is playing catch-up with Paris where some of the best places to eat are wine bars which take their food just as seriously as their wine. I’m not a drinker, but from previous visits both the Euro Hedgie and Snoop Dogg were impressed with the quality of the booze available from the 53-page wine list (yes, 53 pages – where do they store it all?) 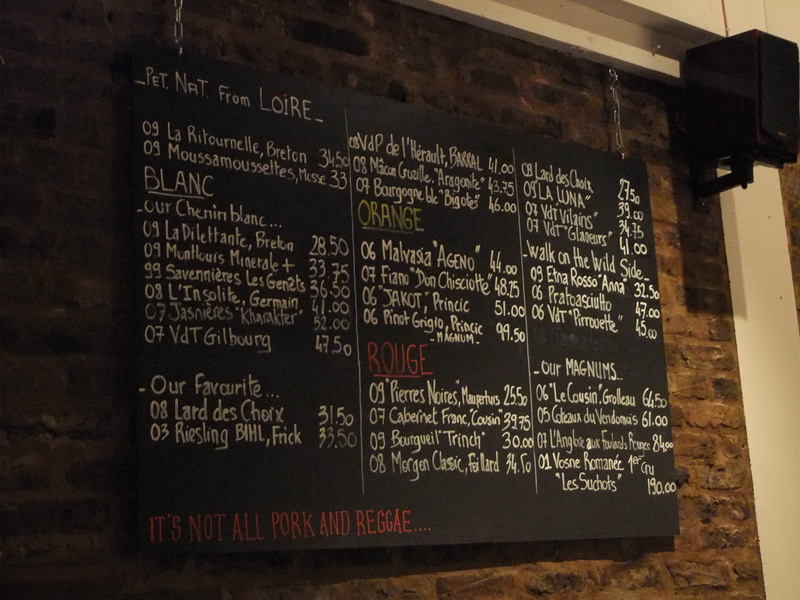 along with a black board listing several guest wines. It’s not all expensive stuff either, with some budget friendly options too. There are also plenty of cognacs and champagnes, among others, but little in the way of beer or soft drinks. That’s a lot of wine (and it’s not even all of it). Wait, it’s not all pork and reggae? Really? Why has no one told me this before?! The decor is a rather odd mixture of exposed brick walls and kitsch French rural memorabilia with the occasional dash of modern art. There are two floors, a noisy and boisterous ground floor and a slightly more subdued lower ground floor. There are different menus depending on which floor you choose to be seated at, with the ground floor menu a fair bit cheaper. That’s not a server cabinet in the back but a refrigerated wine rack. 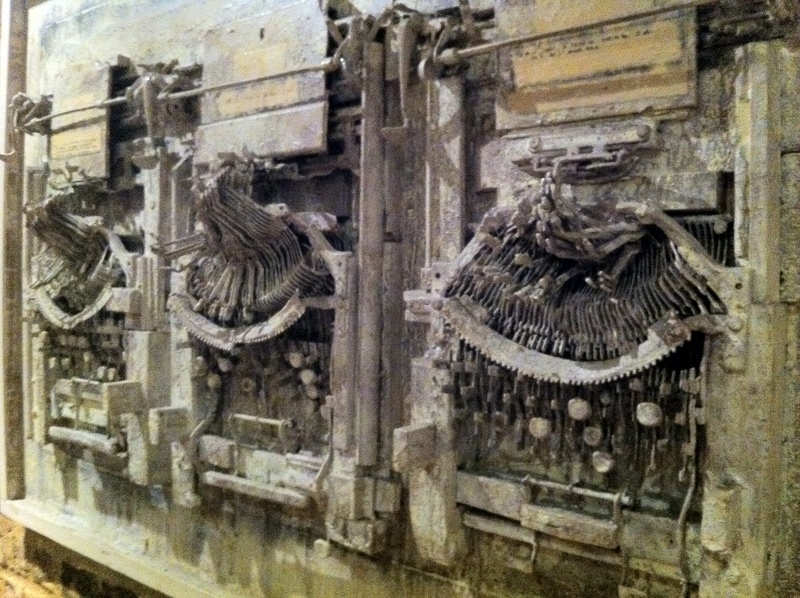 Artsy typewriters mounted on a wall. You ask why, I ask why not. The menu itself changes frequently and, while mostly French, has some Spanish and British touches and the occasional Middle Eastern influence. Although there are a couple of hearty plat du jours, much of the menu is made up of small plates designed for sharing. Pescatarians are fairly well-catered for, but there’s precious little for vegetarians and vegans. This wasn’t a problem on my most recent visit with Baron Greenback where we indulged greatly in a meat-heavy feast. 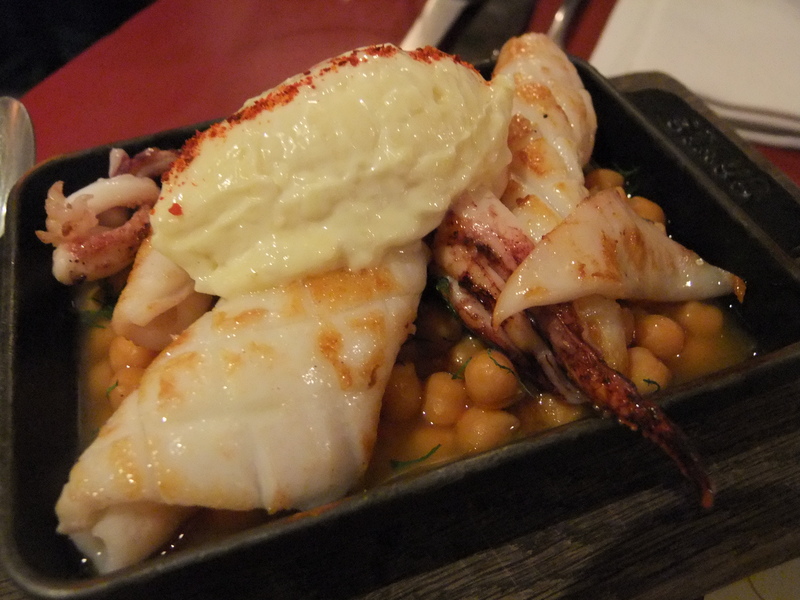 We started off with the Cornish squid served with paprika-braised chickpeas and aioli. The squid was beautifully soft and not at all rubbery. It tasted quite subdued, but it was complimented surprisingly well by the not-too hard, slightly peppery chickpeas and the thick, creamy aioli which wasn’t overpoweringly garlicky. Never seen squid paired with chickpeas before, but it works. 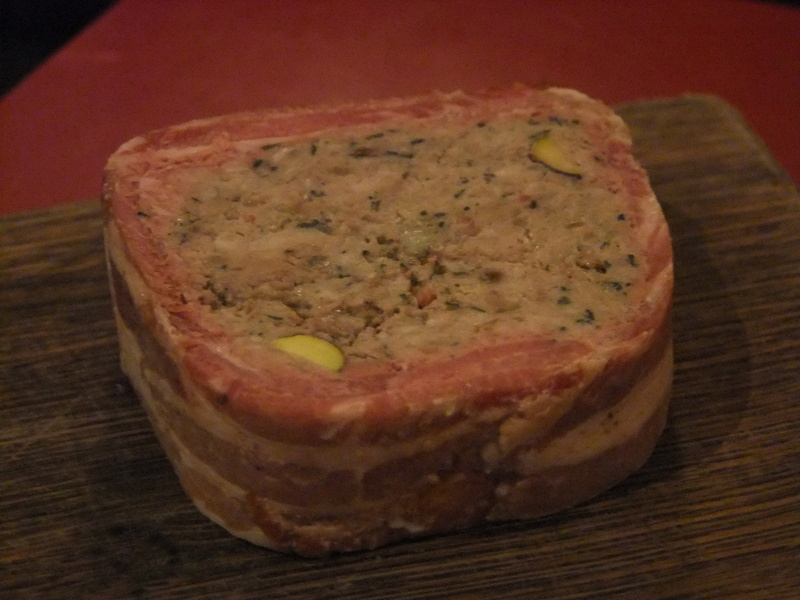 The pork and pistachio terrine may bear a passing resemblance to a supermarket pate, but it is far superior. The salty tang of the coarse meat, which retained much of the fleshy texture of the pig, is incredibly moreish, as is the ring of pancetta that surrounds it. The pistachio chunks dotted throughout are an odd, but tasty touch, although I’d have preferred to see a few more of them in our dish. After having grown sick of substandard pork terrines and pates, Terroirs has restored my faith. Anchovies may be best known as a pizza topping, but the intensely salty, firm little fishies deserve to be savoured all on their own and the Cantabrian anchovies from the Bay of Biscay are some of the best I’ve had. Although served with toast, butter and onions, I was sorely tempted to guzzle them all just as they were, but decorum made me save some for Baron Greenback. These aren’t your mother’s anchovies, oh no. The Jésus Du Pays Basque, simply and hilariously noted as ‘Jésus’ on our receipt, is one of the most distinctively delicious cured meats I’ve ever come across. Salty and slightly sweet, it tastes much like any other French-style salami (or saucisson sec for all you Francophiles out there) but it ends on a surprisingly tangy finish that’s remarkably similar to the mouldy, salty taste of blue cheese. It sounds unpleasant, but it tastes great to the point of being addictive. Our quail dish came spatchcocked which made it easier to split between the two of us. The bird was juicy and tender, although the small, fiddly bones and small amount of meat remind me why I don’t often bother with quail. 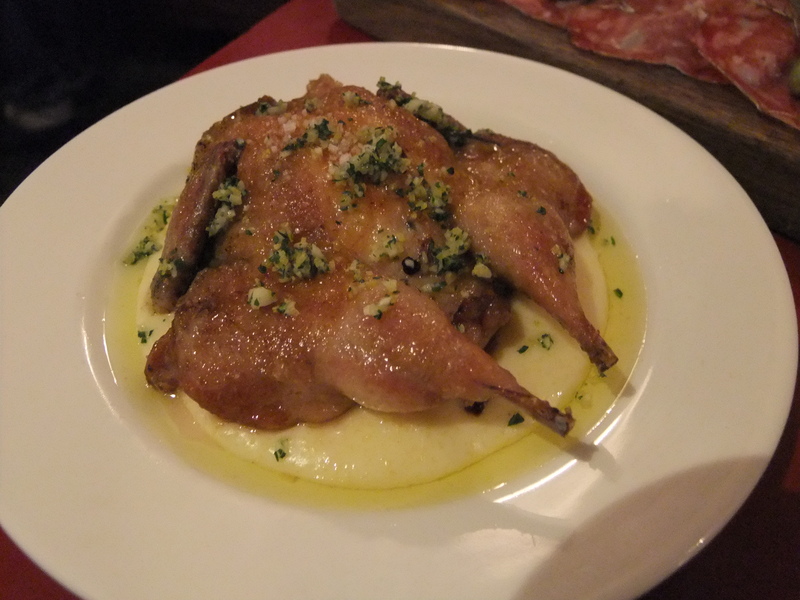 It was accompanied by a zesty, garlicky, creamy white polenta which Baron Greenback wasn’t hugely taken with it, but I slurped up every last drop, even after I had run out of quail to spread it over. The polenta basically steals the show from the quail. By this point Baron Greenback was ready to move onto dessert, but I couldn’t come to Terroirs and not have boudin noir when it’s on the menu. 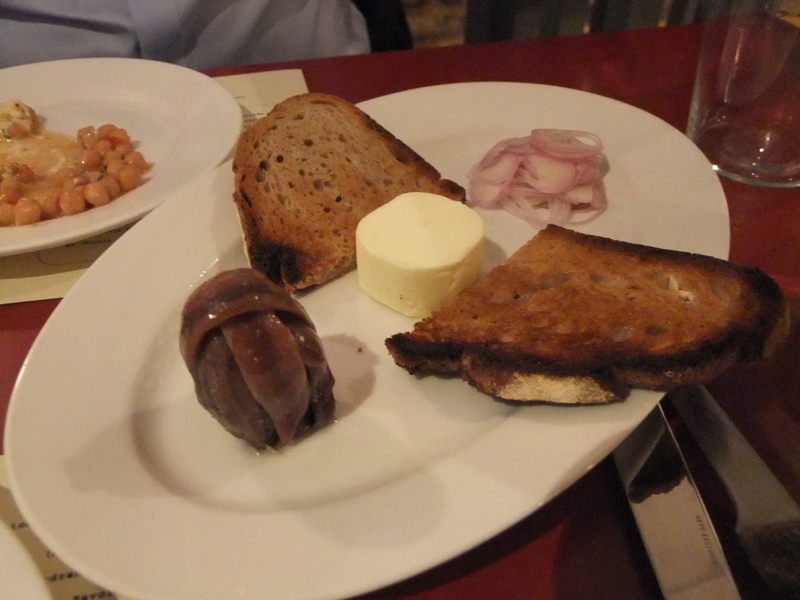 Boudin noir is a black, pork and pig blood sausage that’s incredibly soft, tangy and melts in your mouth. It was served here as a small, flattened, circular sausage, or crepinette-style. It’s quite salty, but it’s also deeply satisfying tasting much like a hearty, slightly boozy meat broth or casserole encased in a coarse, flaky, sausage form. 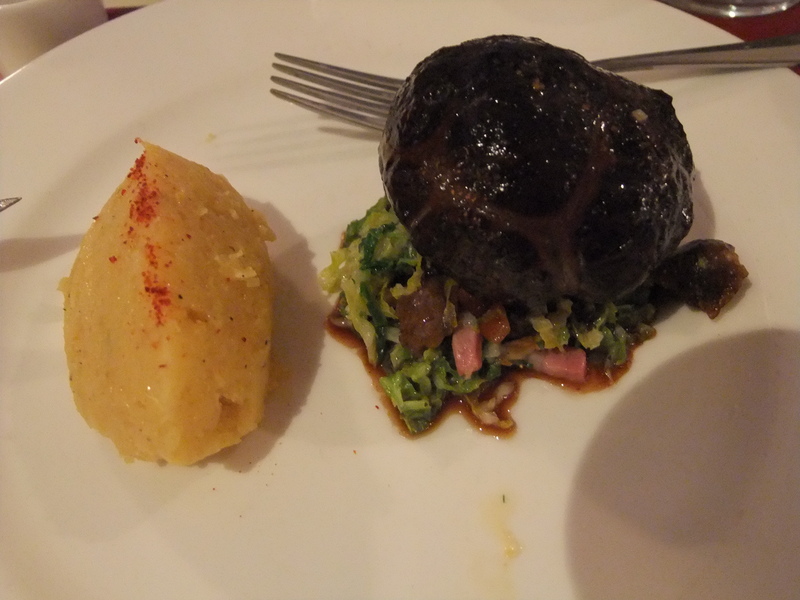 The lardon-like ox cheeks made the boudin noir even more intensely, spine-tinglingly indulgent. Apparently there was some savoy cabbage and swede to go with it, but I was too busy ascending to meat heaven to take much notice. 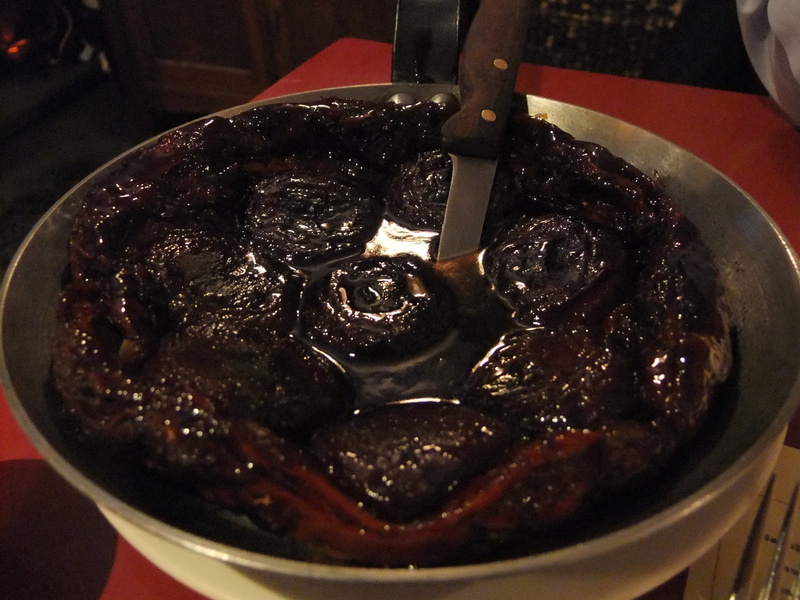 At this point both the Baron and I should’ve called it a night, our stomachs bulging obscenely, but we couldn’t resist trying Terroir’s version of tarte tatin, a French dessert classic. I’m not sure what to make of the dark, heavily caramelised tarte I was presented with (in a rustic frying pan for added effect). It was very sweet, almost molasses-like in its stickiness, but it was a little too heavy for my taste. The fruit could’ve been either apples or pears, it was hard to tell, and I could’ve sworn there was a hint of booze in there too. Desserts don’t seem to be Terroirs’ strong suit – previous visits have always ended with a dessert that isn’t quite as breathtaking as the preceding courses. Service was friendly, efficient and informative, if disarmingly young and fresh-faced. With the possible exception of dessert, Terroirs is a triumph with truly delicious food that reminds me why I love eating out in London, bringing me back again and again. The cuisine is rather rich though, as my waistline can testify, and the boisterous atmosphere makes it better suited as part of a night out with good friends rather than a quiet, romantic meal. Opening Hours: Monday to Saturday – 12.00-23.00; closed Sundays. Tags: aioli, anchovies, boudin noir, chick peas, london, ox cheeks, pistachio, polenta, pork, quail, restaurant, review, salami, saucisson, squid, tarte tatin, terrine, terroirs, wine, wine bar, wine list. Bookmark the permalink.